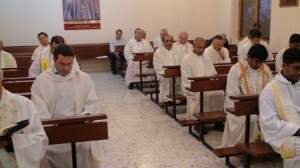 The life of the Oblate of St. Joseph is characterized by a phrase often repeated by the founder, St. Joseph Marello: “Be Carthusians indoors, and apostles outdoors.” It is a phrase that most succinctly sums up the charism and spirituality of the Oblates, in that we strive to live a rich interior life that also leads us to apostolic service in the Church. What follows is a conference given by the first Superior General of the Oblates and the first biographer of St. Joseph Marello, Fr. John Baptist Cortona. “Be Carthusians indoors, and apostles outdoors.” This, my dear confreres, was the maxim which our good father so earnestly repeated. And with good reason, because we who profess the imitation of St. Joseph are implicitly professing dedication to the interior life, which is what we admire most in St. Joseph. First of all, you know that he stands out as a master of the interior life. Now, I ask, how is it possible to put your mind to the interior life without recollection in the presence of God? We cannot pride ourselves on being sons of St. Joseph if we do not strive to imitate him, and we cannot in any way imitate him without devoting ourselves to the interior life, which is impossible without recollection. Therefore, I think I am doing a real service to your souls and by that very fact to the entire congregation by inviting your attention to this all important topic of recollection in the Divine Presence: 1) as an indispensable means for the spiritual life, 2) as a most effective means for the apostolic life to which all of us are called. 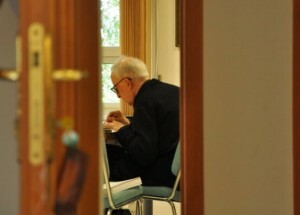 The most important part of the Oblate’s life is his relationship with God, nurtured by a life of prayer. In the first place, what did our founder mean when he urged us to be Carthusians indoors? As you know, the Carthusians lead a contemplative life. In order to succeed in what you might call a continuous prayer life, they impose on themselves a very rigorous silence, so that they speak only on very rare occasions. With this maxim our founder intended to develop in us a love for holy recollection in the presence of God and to lead us by degrees to that life of union with God which is the very life substance of religious life. A religious who does not apply himself to this life of union with God cannot be called a religious; at the most he can be called a good Christian. Now let us see how it is only by recollection that a religious can reach his ideal of religious perfection. Holy recollection is like the salt of religious life. Season your foods all you want; if they lack quality they remain tasteless and can never be relished. In the same way, recollection seasons all the works we have to attend to according to our condition. So the difference between the works of a recollected religious and those of a distracted religious is the same as between salted and unsalted foods. Let us observe this fact by reviewing the actions of the day. The bell rings for morning rising: everyone must get up more or less in a hurry, but the recollected religious immediately summons the thought of the presence of God, he places himself in His hands without delay to carry out the divine will throughout the day, and with this attitude he sanctifies the first action of the day. The distracted religious instead allows his mind to be cluttered with a thousand trivial thoughts and thereby places an obstacle to his prayer. Next, one tends to his personal grooming. The recollected religious endeavors to sanctify even this action with some aspiration: ­“Give strength, O Lord, to my hands, etc.” While washing his face: “Wash me still more from my iniquity, etc;” and so he prays that while water washes his body, the water of divine grace may purify his mind and heart. He goes to church for meditation, Mass, etc. The recollected religious immediately finds himself in the presence of God, makes an act of adoration of the most Blessed Sacrament, unites his prayer to that which Jesus continually lifts up to God in His sacrament of love. And so he finds himself promptly united with Jesus; he reflects that he is going to spend one hour at the school of such a great teacher and he is totally attentive to profit by the lessons of so eminent a master. The distracted religious instead finds himself involved fighting against a host of thoughts, if he makes an effort to fight at all. Not being in the habit of reflecting on his thoughts, he may let a half hour go by without accomplishing anything for his daily life. What is said of meditation can be said also of holy communion, Holy Mass, the Office, etc. The recollected religious does everything with an attentive mind and a loving heart, and thus he grows ever more in divine love. Now we come to study. The recollected religious, besides community prayer which he always recites with devotion, enters into himself for a moment and with his mind he offers his study to God and prays that He will accept it and will give him light to retain what he is about to study. He goes about with his meals and his recreation in the same way. What St. Thomas says is true: when one acts according to reason, his actions are directed to God by their own weight. However, in order to exercise this interior life, this life of union with God, it is not enough to offer up one’s actions in the morning in a general way; we must with each action raise our minds to God, with the intention of doing all for His love. And so, as spiritual writers tell us, we are in a state of always serving God and loving Him while doing what He commands us. At the same time, while harboring the intention of doing everything for love of Him, we are carried along in that life of love, of union with God, which forms, as I have said, the soul of religious life. As you can judge for yourselves, the work of achieving this state of recollection is not too difficult. It is a matter of a little good will and constancy, which we should all have when we think of the great good that results for our souls. In this way we can live throughout our days filled with merit for all eternity. And if we neglect doing so, we are going to experience keen remorse at the hour of our death, and during life we will expose ourselves to the danger of losing even our vocation and ending up for the worse. Another important reason that ought to spur us on to the practice of the interior life through holy recollection is that we must become apostles outside. Jesus tells us: “He who abides in Me bears much fruit.” Now, it is this life of union with God that Jesus wants of us when He tells us, “He who abides in Me.” It is the supernatural life by faith, hope and charity, and by means of this life Jesus communicates to us His spirit, so that we can say with St. Paul, “It is no longer I that live, but it is Jesus Christ who lives in me.” And so it is no longer we who are working by ourselves, but it is Jesus Christ who works with us. From this everyone can see how much more effective our apostolic works become. This life of recollection leads us to be always present to ourselves. It makes us reflect on our thoughts and renders us prompt in banishing those thoughts that can harm our souls. It prompts us to put into practice the saying: Age quod agis (do well what you are doing), and puts us wholeheartedly into the things we must attend to. It keeps our hearts vigilant to drive away affections that are not of God, it places a bridle on our concupiscence and a severe custody on our tongues. From whatever angle we consider this matter, we must conclude that with good reason our good father insisted on his favorite maxim “Be Car­thu­sians indoors and Apostles outside.” Therefore we should set great store by it and practice it, since our welfare and the glory of God so demand. May our good founder obtain for us from heaven, where we have every reason to believe he is, the grace this evening of making the resolution to always attend to holy recollection. Let us also ask the Holy Family for this grace now and always. Amen. And to you also, my dear clerics, divine providence gives a great work to do. You must first of all realize that in calling you to the priesthood the Lord calls you to holiness, since He demands that those who aspire to the priesthood should be holy. Therefore you must set yourselves wholeheartedly to the task of acquiring the holiness that is absolutely necessary. Strive to achieve that development that will render you fit to do good for yourselves and for others. Fight against your defects; force yourselves to acquire the religious and priestly virtues. And since we cannot do anything with our own strength, let us cultivate prayer, both mental and vocal, with all our mind’s attention and our heart’s devotion. Another thing the Lord demands from you is that you develop the talents He gave you, by striving to achieve the human and divine learning required by the sacred canons. If, then, all of us, with stout heart and eager spirit, apply ourselves to this work which divine providence has assigned to us today, then divine providence will never fail us, as it has never failed us in the severe trials already overcome in years past. We shall then rest serenely in the hands of God, as serenely as our beloved father ever did. Amen.